Seen, Not Heard: Ballet Is Woman—So Where Are Ballet's Women Choreographers? Megan LeCrone, Da'Von Doane and Russell Janzen in Emery LeCrone's "With Thoughtful Lightness." Photo by Matthew Murphy, Courtesy Guggenheim WOrks & Process. This past summer, Amy Seiwert was looking for statistics on ballet's women choreographers. She wanted hard numbers to put SKETCH 2: The Women Choreographers—an upcoming program by her company, Imagery—in context. Seiwert knew the ballet world suffered from a shortage of female choreographers; it's a disparity critics have pointed out for years. But she didn't know how pronounced the problem had become. “We looked at all the works ballet companies were going to perform in the upcoming season," says Seiwert, who is also resident choreographer at Smuin Ballet. “It turned out fewer than 10 percent of them were by women." And the situation is bleakest at major companies. It's been five years since San Francisco Ballet last performed a work by a woman. At The Royal Ballet, it's been 13 years since a woman choreographed a main stage work. Seiwert's SKETCH 2, Houston Ballet's Women@Art and a smattering of similar programs have recently put the spotlight back on ballet's “woman issue." But the underlying problem has never gone away. It's not that there aren't any women making works for ballet companies—Twyla Tharp has famously spent the second half of her career doing so. It's that there are only a handful of women dancemakers who have come up through ballet's own ranks. Ballet doesn't have female equivalents to its Wheeldons and Ratmanskys, its top-billed, homegrown male choreographers. Because there has been so little progress over the past few decades—and because there are plenty of prominent women choreographers in other styles of dance—some have written off the issue as intrinsic to ballet. “Onstage, ballet's women tend to be 'wounded birds' who are constantly supported," says choreographer and former San Francisco Ballet principal Julia Adam. “So if you wanted to, you could get really deep about the kind of women who are attracted to the classical form"—and assume that those who choose ballet prefer interpreting to creating. Sarah Griffin and Weston Krukow in Amy Seiwert's "In the Time." Photo by David DaSilva. But that's a false paradigm. Things haven't always been this way. Dance historian Lynn Garafola points out that Viennese ballet dancer Katti Lanner choreographed numerous pieces for London's Empire Theatre as early as the late 1800s. Her Parisian counterpart, known only as Madame Mariquita, made “scores" of ballets at the Folies Bergère and the Opéra Comique during the same period. Then there was the prolific Bronislava Nijinska. “Nijinska was a product of the modernist period, which privileged the personal voice," Garafola says. “It was an idea that gave women a real opening into the art form. Usually we think of it in terms of modern dance, specifically Isadora Duncan. But something similar happened for ballet choreographers, too." In the west during the decades following the Ballets Russes, “there were a number of new ballet organizations founded or essentially founded by women," Garafola says. “It was only natural that in these groups you'd find women choreographers represented"—the most significant example being American Ballet Theatre co-founder Lucia Chase, who encouraged then-fledgling choreographer Agnes de Mille in the 1940s. By the '60s, the power structure had begun to shift. Ballet was becoming increasingly popular, especially in the United States. As its appeal spread, ballet companies became better established, and men started to take the lead. “Historically, the more influential a ballet institution, the less likely that a woman will be in a position of power, and that includes choreographing," Garafola says. “In smaller companies, in newer companies, in companies that have an experimental dimension—you'll find women choreographers there. But once ballet is institutionalized, it becomes a man's world." The “ballet boom" didn't just happen on the world's big stages. Thousands of young girls wanted to dance like Margot Fonteyn and Maria Tallchief, and ballet studios sprouted everywhere to accommodate them. Male ballet students have always been relatively scarce, but as the number of female ballet students increased dramatically, so did the number of studio owners desperate for boys to partner them all. Boys became, essentially, trophies. And the trend has worsened over the past 50 years. “Today, that kind of dynamic is established immediately," says choreographer Jessica Lang, who's on faculty at ABT's Jacqueline Kennedy Onassis School. “In your average class of 7-year-olds, there are 30 little girls and one little boy—and he's on scholarship, even though 15 of the girls are more talented than he is. If you're one of those little girls, it doesn't take you long to learn you're replaceable, and that the more obedient you are, the quieter you are, the better you'll do." As choreographer Emery LeCrone puts it: “Ballet's women have a regimented route to success, whereas the male ballet dancer is celebrated as a rarity." Or, even more straightforwardly: “As a young girl growing up in ballet," Seiwert says, “your ego takes a lot of hits." Compounding the issue is the fact that today, thanks to Balanchine's innovations and the glorification of the limitless Sylvie Guillem physique, expectations for female ballet technique are extravagantly high. The fleet footwork and 6-o'clock extensions that once seemed incredible are now the norm. Because developing such high-caliber technique takes enormous amounts of time, and because competition among women is especially intense, to make it into a company, a female dancer must maintain a singular focus on the physical, perhaps to the exclusion of creativity. 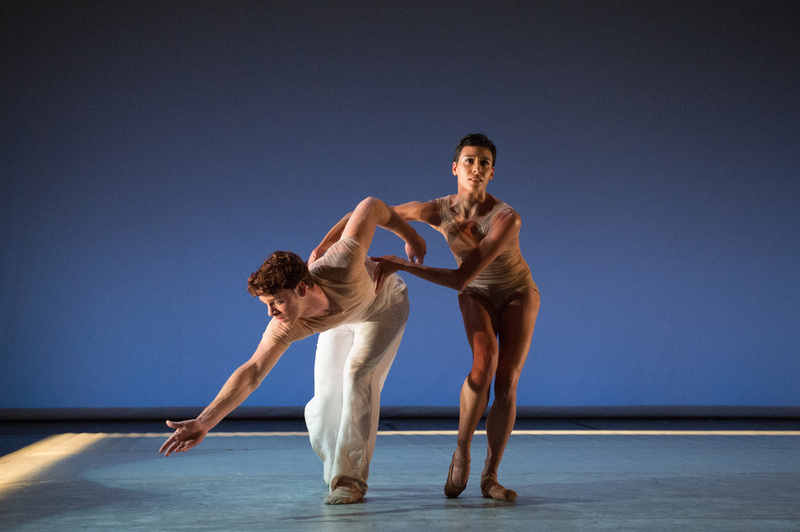 Ballet Memphis in Julia Adam's "Dew Point." Photo by Andrea Zucker, Courtesy Ballet Memphis. Company life—particularly in the corps de ballet, where women are expected to fit the same swan-mold—doesn't encourage creative effort, either. “If you slip, the girl next to you is ready to step right in, and by the way, she looks exactly like you," Adam says. “You start thinking: What's unique about me? Do I have anything important to say?" LeCrone, who still dances occasionally, abandoned the big-company track for that reason. “There was a point where I realized what made me a good choreographer was what hindered me as a classical ballerina," she says. “In a company, you're told to dance like everyone else. That can make for extraordinary moments onstage, but to choreograph, you have to embrace your individuality." If you're an exceptional dancer—LeCrone names Wendy Whelan—you might get opportunities to develop your personal identity. But those opportunities usually involve interpreting others' choreography, becoming a muse, not a creator. And in the end, how many Wendy Whelans are there? Several ballet companies have launched choreographic initiatives to give emerging artists a safe space to develop work, and most of them actively seek out women. The New York Choreographic Institute has nurtured over a dozen women—including Adam, Lang, LeCrone and Seiwert—since it began in 2000, for example, and ABT mounted the (sadly short-lived) Voices and Visions: The Altria/ABT Women's Choreography Project in 2008. Beyond those supportive environments, opportunities for women are limited. “I don't think there's any conscious discrimination happening, but this is not a good time financially for ballet, which means there are fewer commissions to begin with," Seiwert says. “And when companies do commission, they want a Wheeldon, or a Ratmansky, or a McGregor—you've got your top four or five safe bets, and they're all men." When directors hire women choreographers, they tend to group them on all-women programs, in part because those events get significant press coverage, offsetting the risk factor. But directors aren't integrating women choreographers into their regular programming. That said, well-intentioned equality initiatives can backfire. “The last thing I want to have happen in this field is for people to say, 'We need more women, bring in the women!' and to start giving opportunities to people who aren't ready for them, who haven't been given time to develop," Lang says. “The resulting work probably won't be good. And that will only make it seem like women are weaker." Instead, Lang suggests, change should come from the bottom up. “We need to add creative courses to the ballet curriculum, so we can develop young artists who think creatively instead of just seeing their bodies as tools," she says. “A ballet dancer is not going to lose her turnout if she plays around in a composition class for an hour. But that class will help her establish an open mindset, so she's not inhibited and afraid." Improvisation and composition courses will make students better performers, too. “If we get young girls more comfortable with actively making choices, instead of just teaching them how to point their feet on count three—that will only increase their value as performing artists," Seiwert says. “They'll learn how to take charge of their artistic development." College dance programs, Seiwert notes, also put a strong emphasis on independent thinking. The number of strong university ballet programs is steadily increasing, attracting more talented ballet dancers. As college graduates begin to make up a larger percentage of the ballet world's swans and Wilis, we might start to see more of these women breaking into choreography. Here's hoping. “Choreography shouldn't be a gender issue," LeCrone says. “It should be a talent issue. There are great women's voices yet to be heard."